As the year flashes past and winter steadily progresses into spring it is time to start thinking about the fish that will be entering your favourite estuarine flat following whitebait. Kahawai and trevally make an early appearance but perhaps of more interest is the apex predator that shadows them, Seriola lalandi, the yellow-tailed king of fishes. Last year I started to hook kingfish in amongst the moored boats and marker buoys in my favourite estuary in September. Initially I was using my normal 12 lb braid and 15 lb trace but this was treated with absolute disdain. The first kingfish I hooked snapped the braid after 10 minutes. My reaction was to change up to heavier 17 lb. braid. The second, hooked in October, wore through the trace after a 15 minute struggle. The relentless beating of its huge tail on the line as it headed away from me across the current in yet another withering burst shredding the nylon like cotton. Getting ever more desperate by November, I upped the braid to 20 lb and the trace to 20 lb and started to use larger lures to target the kingfish which seemed to appear out of nowhere every alternate session. The fish I hooked in November took the Rapala like its life depended upon it and was almost under control after 15 minutes. 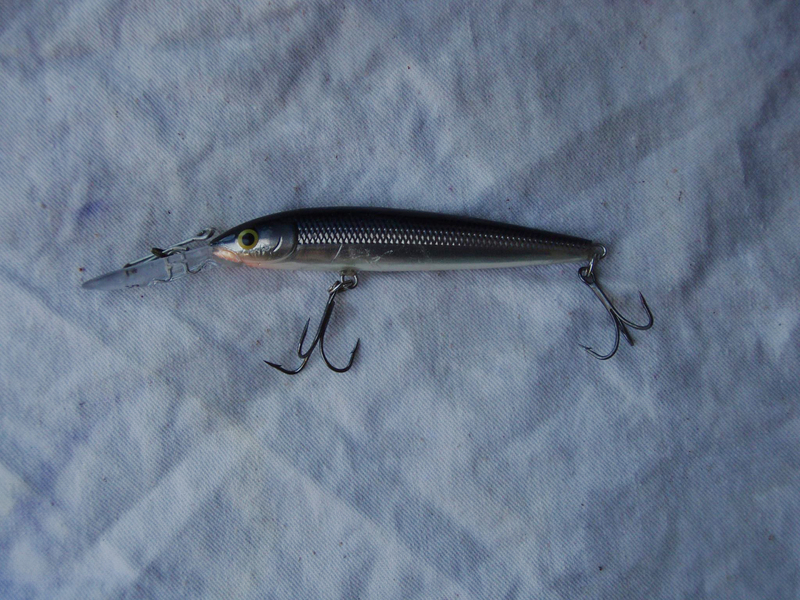 That was until it hit the shallows where it broached and destroyed the trebles on the lure (see photograph). “Low tide was at 8.00 am and when I awoke at 5.45 am it was still, warm and overcast. Perfect conditions in paradise. I quickly got dressed, grabbed my tackle and was turning off the ignition in the car park by 6.15 am. The tide was well out and the walk across the flats was beautiful in the early morning light. Surprisingly the tidal flow was fairly feeble so I opted to attach a 2.5″ Bento bait on a 1/6 oz. Nitro jig head. It hung up on the bottom on the first upstream cast which confirmed how anaemic the flow actually was. I was forced to cast slightly downstream and swing the soft plastic lure along the bottom as if it was a wet fly. 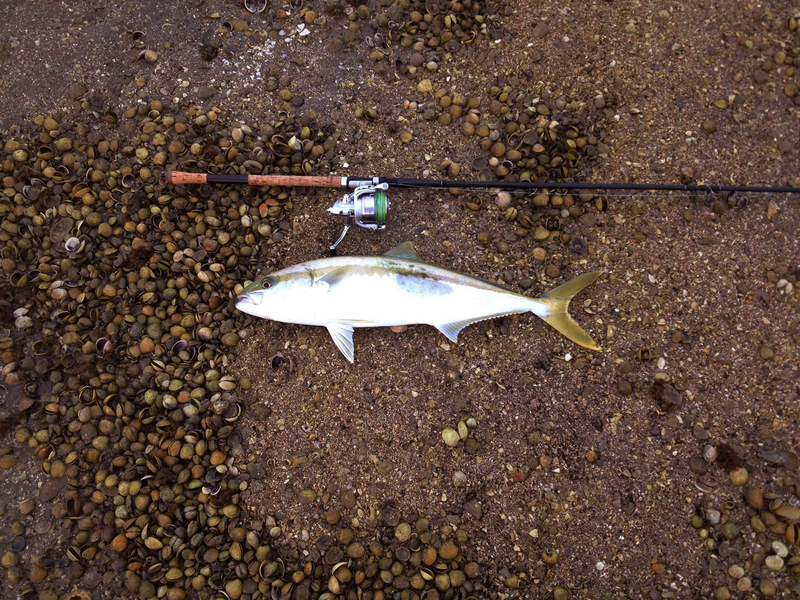 It felt very fishy and it came as no surprise when I hooked and landed 10″ kahawai on cast 3 and 20. Some inner sense then took hold and I ambled downstream to focus on the area near where a large catamaran was moored. First cast was retrieved unmolested. Second cast plopped in close to the catamaran and sunk steadily to the bottom. I twitched the lure slightly and it got absolutely monstered by a leviathan. I struck hard, the rod bent double and braid literally evaporated from the spool, cackling loudly as it was torn off layer by layer. The first run saw 40 metres of line disappear as the fish sped out across the channel at warp speed between two yachts. Eventually it stopped and I back pedalled furiously applying side to bring it inside the moored yachts. It was shaking its head furiously but thankfully followed. Next it took off downstream running parallel to the shore, me running to keep up and try to keep level with my rapidly departing foe. I eventually got below it and then it took off back upstream, again with me in hot pursuit. When I got level it turned tail and headed back out towards the open ocean. This time though it managed to catch an underwater snag so I had to wade out up to my thighs to free it. Thankfully it was still attached when I freed the line. By now I could feel that it was tiring so I started to walk it out slowly, straining hard to see what it was. Seconds later a big yellow tail broke the surface and I knew immediately what it was, a kingfish and a nice one. From there it was relatively straight forward to beach it, take a photograph and gently slide its chunky 60 cm bulk back into the estuary. So there you have it. I’m already in planning mode and this year I will be ready! Imagine hooking a fish like this on a double handed fly rod. Be still my beating heart. Thanks Darren. Glad you found it useful.